The 2002 recordings featuring Percy Jones, Lance Carter and Gerry White IS OUT! The 9 track album is titled "Comprovisations in Linear B". Available from on CD via Bandcamp and for download on iTunes etc. 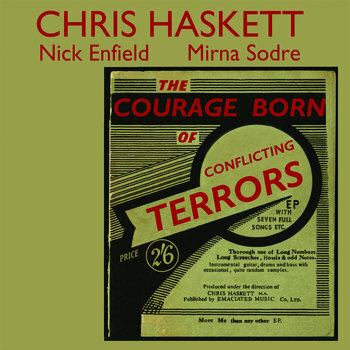 The next Chris Haskett CD is a 4 song EP called "Insuffucient Necessities". It's probably the most user-friendly/conventional release I've ever done (which isn't saying much). Instrumental rock angularity in the Jeff Beck-iiverse. This should see the light of day in June or July. VINYL TOO!! The end of 2018 or beginning of 2019 will see a CD of just covers called "Partly Uncovered". Details follow. Chris Haskett is a guitarist, producer and composer. Primarily known as the guitarist with the Rollins Band, he has worked as collaborator or sideman with a diverse group of musicians including, Iggy Pop, <span style="color:#FAEBD7;">Steven Brown</span> (Tuxedomoon), Foetus, Jah Wobble, Pigface, Utah Saints, Chris D (Flesheaters), The Cassandra Complex, Reeves Gabrels, Lloyd Cole, Elliott Sharp and, for a NANOsecond few months, David Bowie. He has appeared on more than thirty albums and released eight solo records, six centered around the guitar and two, under the name DJ Linux, of turntablism. Another show with Flemming and Greta. Free entry. Playing with Flemming Borby and the legendary Greta Brinkman. 5 euros, come down if you're around! Last Trio gig for a while as we're going to start recording the next EP soon. IT'S FREE! I've finally gotten round to putting ALL of my released music on youtube. It's strange to me but apparently that's where a lot of people listen to music. So there it is. There's much more to come with new releases and live stuff in the pipeline too. Article on yours truly and the 9-string in Gitarist magazine (for those of you who read Dutch). The nice but uncredited BW pic is by Jeroen Geerts. Thanks Jeroen! Article (in German) on yours truly in the April edition of GItarre un Bass. Apparently I am a "Schrägmeister". I hope that's something good. Cool article on the PRS 9-string at Music Radar with a link to a Youtube video I put up.